We are so happy to donate a portion of the sale of every Tails Untold Personalized Pet Book we create. Here are some of the latest donations made to help every pet find a loving and fur-ever home! Great news! We are proud to have donated to the Animal Defense League of Texas today. This is a no-kill animal shelter in San Antonio. This was part of the Big Give SA and the Animal Defense League. I love their motto “Pets are not disposable”. This donation went to help keep pups cool all summer long by allowing the shelter to build new shade structures that are needed this summer. At Tails Untold® Personalized Pet Books, we believe every pet deserves a loving and forever home so we donate a portion of the sale of each and every book to a shelter/rescue. Thanks to the many who purchased a Tails Untold® Personalized Pet Book, we are so pleased to be able to make donations to these wonderful organizations. We thank you all for all you do to help our furry friends find forever, loving, homes. Thanks to another Tails Untold Personalized Pet Book purchase www.tailsuntold.com,, we are so pleased to contribute to the Mayor’s Alliance for NYC’s Animals, NYC Feral Cat Organization. Here is the link: http://nycferalcat.org. The New York City Feral Cat Initiative (NYCFCI) is a program of the Mayor’s Alliance for NYC’s Animals. (Please note, this organization is not associated with any political office). This Alliance is committed to solving NYC’s feral cat overpopulation crisis through the humane, non-lethal method of Trap-Neuter-Return (TNR). We appreciate all that they do to contribute to making our pet world a better place so that someday, maybe every cat/dog & other pets will have loving and forever homes. Tails Untold Personalized Pet Books is so pleased to make a donation to the Connecticut Humane Society thanks to Lois’s purchase of a Tails Untold Personalized Pet Book for Steve and her special cat, Foxboro. Foxboro was such a cute orange tiger cat. He is now playing at the Rainbow Bridge. Here is their mission statement. The famous and very special Bocker the Labradoodle has discovered he has Lymphoma. Not only is he quite famous having participated in many movies, photo shoots,interviews and more, he is a therapy dog and is one of the most caring, giving and special dogs we have ever known. Bocker was one of Tails Untold Personalized Pet Books first customers. We loved creating his book, but more, we loved getting to know him and his mom, too! We send prayers he can beat this terrible disease! If you are able to help Bocker, please see the Fundraising page information, below. Thank you all and Best Holiday wishes! Bocker who has done so much for so many—from differently abled children and adults to raising money for good causes—now needs YOUR help. We just learned that Bocker has lymphoma and, without treatment, has just a few months to live. New treatments, which are costly, are giving pets more quality time here on earth. 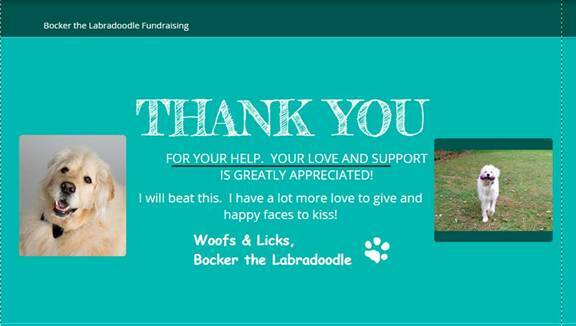 So, ANIMAL lovers, if you can find it in your heart, we are asking that each person donate whatever you can to help Bocker. He has so many more kisses to give and lives to touch and smiles to bring. If Bocker has ever touched your life or the life of anyone you know, please help and Donate. Bocker needs to continue his mission of making others happy! Fundraising page: Fundraising For Bocker or you can donate through Pay Pal to bocker@bocker.tv. Big Woofs & Licks from Bocker! Thanks to everyone for your love and support. All my friends are definitely part of Team Bocker! 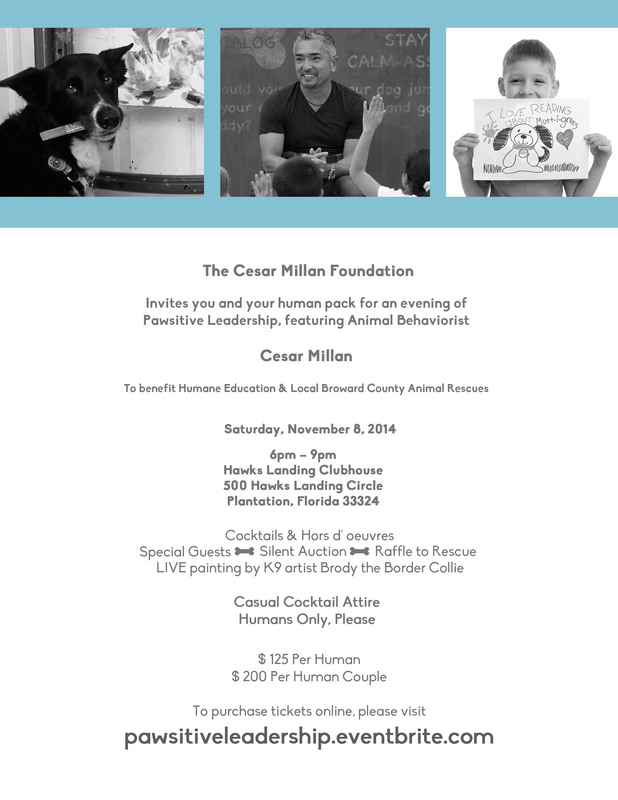 Tails Untold was so pleased to have donated a Gift Certificate for a Tails Untold Personalized Pet Book to the Cesar Millan Foundation’s Pawsitive Leadership Event’s silent auction held in Plantation, Florida on November 8, 2014. This event sponsored by The Cesar Millan Foundation was a benefit for the Humane Education & Broward County Local Animal Rescue. The event and silent auction was a great success and we were happy to be invited to contribute!